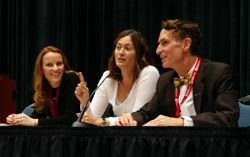 Bill Nye, "The Science Guy," Jessie Deeter, the producer of Who Killed The Electric Car? and Revenge of the Electric Car, and our own Chelsea Sexton took to the stage at the close of public night at the Plug-in 2010 Conference. With this line-up, it was more than 66 percent the same as last year, when Nye, Sexton and Electric Car director Chris Paine answered audience questions. Given the "preaching to the choir," audience-led nature of the event, we thought there would probably be a lot of readers who would want to "attend," digitally, so we're posting an audio recording of the entire two-hour event after the jump. What does it contain? How about a short preview (verbal, not video) of Revenge of the Electric Car? Deeter said that the film will focus on three main stories: General Motors and the Chevrolet Volt, Tesla Motors, Nissan and the Leaf and electric car mechanic Gadget. How about the panelists' predictions of the percentage of new cars that are plug-ins by 2020? Nye said he doesn't think it'll be 10 percent, Sexton said it'll totally be determined by how many the OEMs are willing to build. How about lots of disparaging comments about adding sound to silent electric cars? How about Nye calling lithium supply worries the "reddest of herrings"? How about one member of the audience proudly saying he's been driving an EV1 since 1998, and Nye replying, "You must be exhausted"? Zing! All these classics and more await you after the jump. Or download the MP3 here (40MB, 2 hours).